I am banned from FaceBook for a week...for reasons. I *had* a backup account, but someone reported it as someone pretending to be me, and facebook deleted it. So, somehow my Tuesday became a Monday. Fortunately, I can livestream the #HeroLabradorsPuppycam on Youtube. Here it is: the #HeroLabradorsPuppycam! 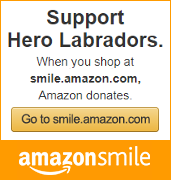 Hero Labradors Breeds with H.E.A.R.T.